Imagine you’re the little distributor with the rights to sell a product. What is potentially a multi million dollar product. Great, you’ve got a product you can take online so you finally made it. All you need is a website right? Then you will have joined that elite group that make a living online, you know, the “Sit at home in my underwear (Sorry about that image) at the kitchen table making money while you sleep” dream. Good luck with that! We all know the reality is that if it sounds to good to be true, it generally is. 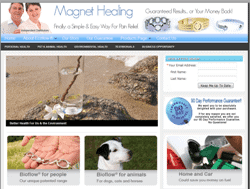 Had a meeting with this distributor of a magnetic healing product. A great product range that gave a healthy commission but the bottom line is any product, regardless of value or potential, is not worth a brass razoo if you don’t have a cost effective way of getting it to market. Helen is a real estate agent. They knew there had to be a life after real estate. Let’s face it, successful real estate agents work pretty well 24/7 so they don’t really have a life. As a family they wanted to create another income stream. So we went to work creating their “sideline”. The site is now “live” and the products online. And here’s the big thing, apart from being able to make money online. Their site is outranking the corporate site on the “Alexa” Rank scale – you can read about Alexa here. It’s just one of the “yardsticks” we use to see how the world views all websites. and the corporate site – http://www.ecoflow.com/ – is sitting on 2,133,240. The closer to “zero” the better. It’s not much of a gap but it’s in our favour. The corporate site does have a far better Google page rank simply because ours is a new site, that will take more time. Helen’s obviously a happy lass. So’s hubby. What a thrill it was to have our first follower register to receive our newsletter and that was only after 1 month of designing the web site. We have now started to sell on line without really even getting our site fully recognised. Pete really knows what he’s doing. Make sure you follow his instructions. He really helps to open doors. He gets you recognised even when you’re a novice (at web stuff). Can’t wait to see the results now that we’re ready to take on the world. ← All It Takes To Be a Rockstar!